Those taking part included the Gadget Show’s Jordan Erica Webber (who hosted the event), local studios Sega Hardlight, Playground Games, Codemasters and Ubisoft, UK wide universities and a number of smaller independent studios. There were also visits from Matt Western MP and Minister for Digital, Culture Media and Sport Jeremy Wright MP, WGC Warwickshire President Chris White and a surprise appearance from Sonic the Hedgehog. Cllr Peter Butlin, Deputy Leader and portfolio holder for finance at Warwickshire County Council, said: "Interactive Futures provided an excellent opportunity to showcase the world-class gaming talent we have here in Warwickshire and puts Silicon Spa on the map as a destination to set up new businesses in the area. "We are proud to be the home of Silicon Spa, which plays a key role in our thriving economy and it is events like these that help to inspire many young people and show them the career opportunities available to them in the county." Parveen Rai, Director of the Coventry and Warwickshire Local Enterprise Partnership, said: “This event has given us the perfect opportunity to showcase the innovative and growing video game companies which are based in the region working on some of the world’s leading games. Steve Taylor, WCG Dean of Higher Educations, said: “The Interactive Futures academic conference held at Leamington College was a fantastic opportunity for academics and industry experts to share their insights and research together in the heart of 'Silicon Spa'. “With presentations ranging from historical perspectives on play and serious gaming, to applied gamification of education, health, and society, the conference once again confirmed the College's role at the forefront of research-informed teaching and academic debate." Chris White, WCG President and Director of Institute for Industrial Strategy, King’s College, London, said: “I was delighted to be invited to open the inaugural ‘Interactive Futures’ conference at WCG’s Leamington Spa campus. 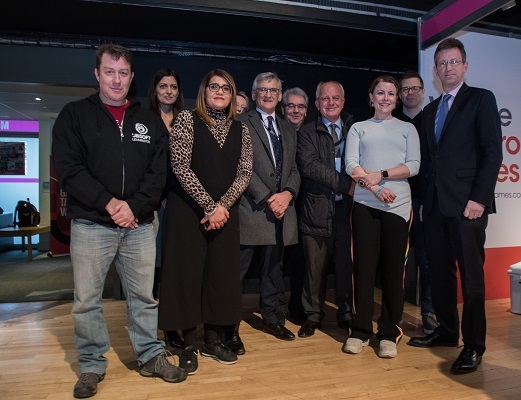 The Games industry plays an increasingly important role in Leamington, and this event showcased not only the potential it has for the local economy, but also how business and the College can collaborate to provide a gateway for students into the industry."